Introduction: Sloan is a slum dweller residing in Old City, which is designated to be the waste disposal facility of the New City. The New City is controlled by the all-powerful and all-pervasive corporation, Eternal Yggdrasil Enterprise. Something, or someone? Sloan brushed away his irrational fears whilst panting heavily from the run. He should be invisible in the eyes of the Eternal Yggdrasil Enterprise (E.Y.E.) surveillance bot: Old City slum dwellers were not ID code-tagged as alive. Sloan gasped, suddenly realising that he had put the AI chip into his pocket earlier. Better to be safe than sorry. Sloan braked and took cover under the scratched and bent hoods of Toyotas. Then there was a decrescendo and the siren became a whir and the whirring got softer and softer. The bot was returning to the E.Y.E. headquarters. Sloan stared at its ascent, transfixed by the dreadful red halo. Will he discard the AI chip or keep it? Inspiration struck Sloan. He ran excitedly to his makeshift bookshelf in that hovel of a home on Avenue 20. Maybe he could learn how to construct an AI bot from scratch. Sloan pulled out a thick hardcover “How to Build a Robot from Junkyard Materials” and thumbed through the first chapter. 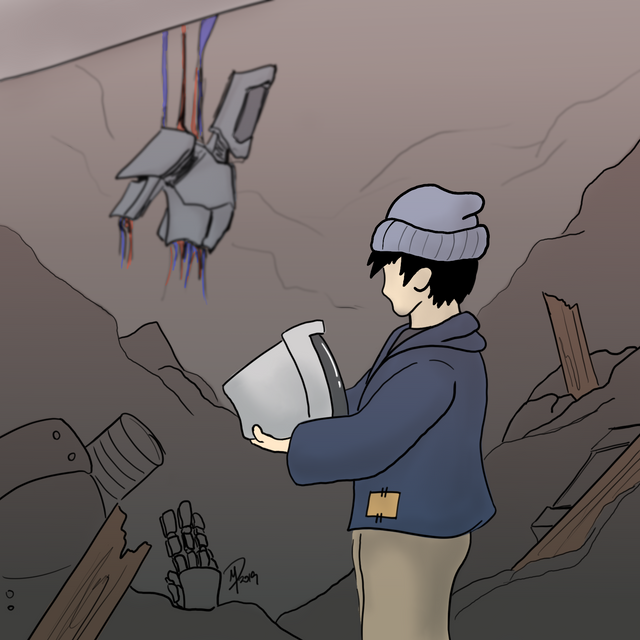 It was not long before he went back to dumpster diving for the bot’s head. Eventually he found a slightly bulky monitor screen. Sloan nodded to himself approvingly. Into a pile of rusting machinery parts fell Sloan. Hard. 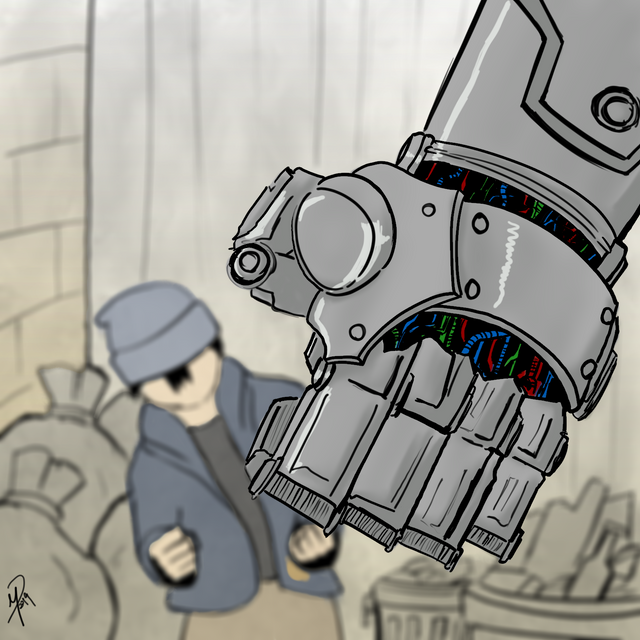 The Avenue 33 gang shook their robotic arm fists at him menacingly. “Yeah, because you’re so useless you can’t even run,” sneered the group of five older youths as they sauntered away. He just lay there in the darkness. Whilst snatching breaths through bruised ribs, Sloan thought that as from the dung heap he came, so to the dung heap he returned. The dung heap was where he was born and lived his life; it was all that he had ever known. Sloan gingerly pushed himself up with his palms when suddenly, his right palm dug into something sharp. 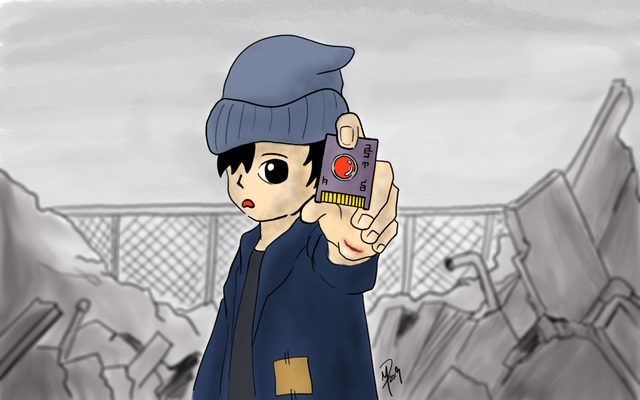 “Ow!” He yelped in pain and withdrew his arm, only to see an AI chip. His curious streak impelled him to pick it up. Abandoned AI chips from the New City was very commonly found but this chip was shiny, glistening with strange symbols. It pulsated a life of its own. It might fetch a good price, Sloan thought to himself as he pocketed the AI chip. 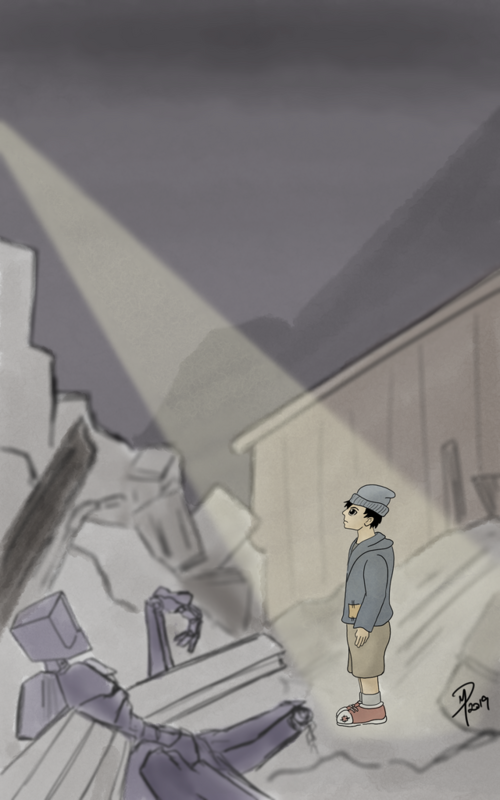 In the past there were days where he spent every waking hour rummaging through trash and yet finding nothing. Today, he got lucky. The excitement was quickly eclipsed when a pang of self-pity hit Sloan. The crowning glory of his life was that he found a good piece of trash. Shoulders slightly slumped, Sloan plodded over to Avenue 22 to continue his scavenger hunt. Junk is still just junk. Out of all the dumping sites of Old City, Sloan liked that place best. It was only at Avenue 22 that an ethereal stream of light from New City shone down. 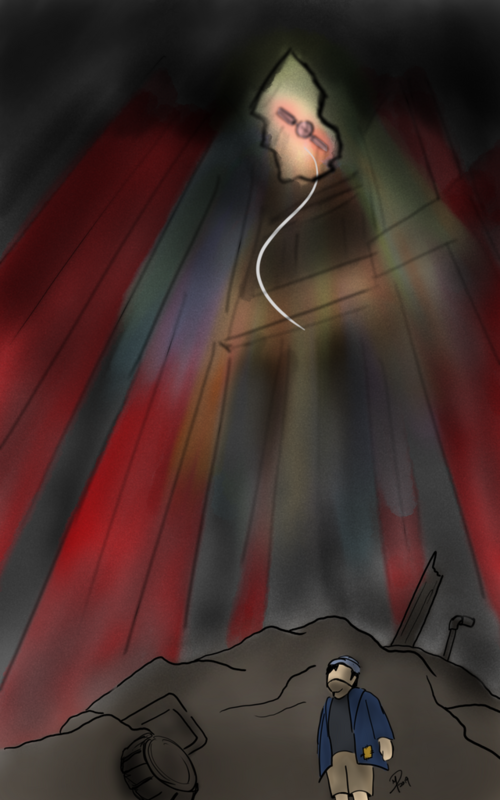 The light never failed to strike him blind for a minute or two – Old City was perpetually draped in a gun-metal grey darkness – but he didn’t mind. Bathed in that white light, Sloan could dream. A soft buzzing whir, all too familiar to Sloan, disrupted his dreams. He stiffened up, back upright and eyes peeled open. The Eternal Yggdrasil Enterprise (E.Y.E.) surveillance bot was approaching Avenue 22. The whir evolved into a deafening siren. Sloan had to cover his ears with his hands, for the sound pierced through his eardrums and into his soul. It was shrill, like that of twice-ancient pterodactyls. Hurriedly, Sloan ran away from the E.Y.E. 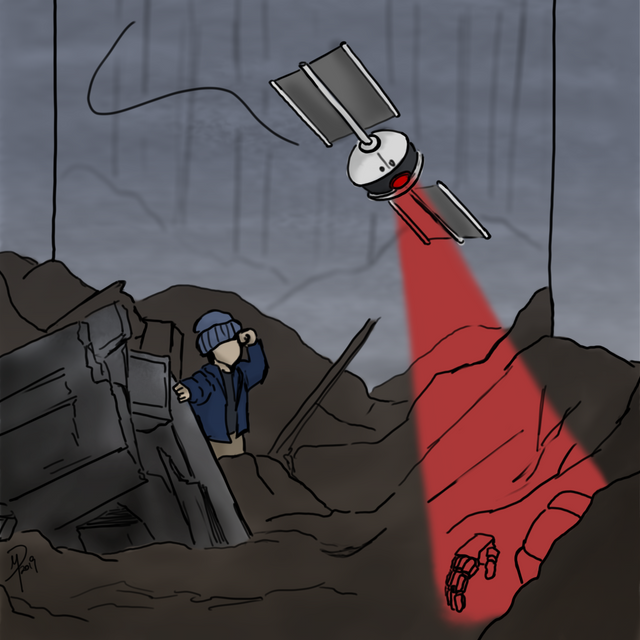 surveillance bot and its red laser scanners. More than ever he tasted fear on his tongue; it seemed that the bot was not merely here to conduct its cursory mid-day round. Was E.Y.E. looking for something? The ditigal artworks and story are all original, borne from a collaborative effort by Matthew (my graphic designer boyfriend) and myself. Get the Eternal Yggdrasil Enterprise surveillance bot merchandise HERE! That was a fascinating fiction story. And you added some illustrations for a better imagination. I like the idea od how you defined the EYE! Brilliant indeed.. its also like saying, EYE SEE YOU! hehehe..
Nice work, @joeylim! And congrats on your Curie upvote! Hi @joeylim, great work and nice story. I found you via @curie. Your art/drawing skill is impressive. I especially like your approach of making close objectives sharp and the further you go the more blurry it gets. This feature brings more "space" into it and the drawing looks more lively. It's actually not my drawing/art; I'm the writer. The designer responsible for all the art is my friend. @curie I'm very honoured!! 🌻 Thank you so much. Your UA account score is currently 2.788 which ranks you at #13154 across all Steem accounts. Your rank has improved 135 places in the last three days (old rank 13289). In our last Algorithmic Curation Round, consisting of 179 contributions, your post is ranked at #9. I wish I had seen this earlier. I would have included it in today's Spec-Fic Parade. You would make a great addition to the Speculative Fiction Writers of Steemit group. Haha, not sure yet because I wish to combine several parts and release them at one shot (instead of the initial idea of 2 days at one time). impressive and creative work! only to write an original story it takes a lot of time and effort but if you consider also the great illustrations it is easy to understand how passionate you are about it, thank you to amaze us with your crativity! Great colaboration. Illustrations accurately represent a chaotic world that blurs the vision. I so want speculative fiction writers to be wrong about the future. The idea of so much work, time, resources and lives put to the service of advance technology and urbanization only to see all that destroyed and humanity reversed to primeval stages is so human, so aligned with our current and trending behavior.